Yoshino Fujieda is a human being from the Digimon Savers canon. 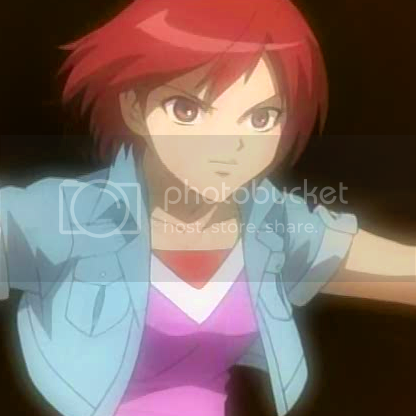 Note: This and the following section mixes material from the series canon as well as from personal canon, and also contains spoilers for Digimon Savers. Yoshino was born as one of the youngest of three sisters. As a child, she was motivated to excel by her parents - they were by no means abusive, but their desire to see their daughter succeed wore heavily upon Yoshino, and created a lingering sense of self doubt that stayed with her all of her life. As a young girl, Yoshino went to school with a young boy named Hitoshi Hanamura. Hitoshi was picked on for being overweight, and Yoshino was one of the few other students that was kind to him. This would have an impact on an event later in her life. One night, during a piano recital, Yoshino was overcome by her anxieties, and was unable to play, effectively embarrassing herself in front of a large group of people. After the recital, she stayed alone backstage, where she was moved to tears. Then, however, a mysterious voice called out to her, leading her back to the piano she'd been unable to play before. Yoshino was able to play it as the voice sang along with her. Then, an egg appeared from a ray of light that had been shining down on her, seemingly connected to the voice that had contacted her. The egg was a Digi-Egg - one that hatched into a digimon called Budmon. Though the circumstances for Budmon's appearance were very mysterious, she and Yoshino became fast friends. When Budmon evolved into Lalamon, the song that hey had performed together became the basis for Lalamon's own "Sing a Song" attack. With her partner, Yoshino drew the attention of an organization that was dedicated to investigating phenomena related to Digimon and the Digital World. This organization was called DATS (Digital Accident Tactics Squad). Yoshino was confirmed to have a Digi-Soul, which in her world, was able to trigger a digimon's evolution. Lalamon and Yoshino had formed something more than an emotional connection - or perhaps, this second connection was due to that emotional bond. When Lalamon was proven to not be a danger to humans, she was allowed to stay with Yoshino. This widened the gulf between her and her family, who were taken aback by the digimon. When Yoshino turned sixteen, she became a member of DATS herself, and lived there until she became a legal adult and moved into her own apartment. Though she was a competent agent, her sense of doubt kept her from excelling, and she did not begin to reach her full potential until some time later. As a member of DATS, she formed a friendship with her commanding officer, Rentarou Satsuma, whom she came to see as a father figure. After two years as a member of DATS, Yoshino remained in her position as a field agent. The greatest adventure of her life would not begin, however, until the day when she and Lalamon investigated a digimon that had been code-named "Raptor-1." The so-called Raptor-1 had escaped from DATS, and when she and Lalamon found him, she found that Raptor-1, or Agumon as he was properly called, had engaged a human in battle. This human was named Masaru Daimon, and prior to facing Raptor-1, he had engaged a number of rival students in combat. Masaru and Raptor-1 battled each other to a draw while Yoshino looked on, and once it was finished, she and her partner attempted to arrest them. They escaped, and Yoshino was forced to approach Masaru on her own. She told him about DATS, and asked him to turn over Agumon. When this didn't work, she lied to him about Digimon needing a special food made only at DATS to avoid starvation. Masaru agreed to go with her, and learned more from Captain Satsuma. However, this meeting was interrupted by Agumon's supposed attack of a hamburger restaurant. Yoshino and Masaru went to investigate, and discovered the real perpetrator was a digimon called Cockatorimon. Yoshino was kept from participating in the battle, and was forced to watch as Masaru evolved his new partner to GeoGreymon for the first time. Almost immediately after these events, Yoshino was ordered to live with Masaru and his family until she managed to convince him and Agumon to join DATS. At this time, Yoshino developed a friendly relationship with Masaru's mother, Sayuri, and his sister, Chika. Later, Masaru and Yoshino investigated a Digimon-related event at Chika's school. A digimon called Kunemon had fed into the desires of a young student and devoured the school pets that he had been charged with taking care of, and attacked Yoshino and Masaru when this was discovered. Yoshino attempted to stop the digimon by evolving her partner to Sunflowmon, but in the end, it once again came down to Masaru and Agumon to win the day. After this, Masaru decided to join DATS, and Yoshino served alongside him and their other teammate, Touma H. Norstein, who returned to DATS Japan from Europe some time later. Some time later, Yoshino's childhood friend, Hitoshi Hanamura (now known by the stage name of Neon), became suspected of harboring a Digimon. Because of their past relationship, Yoshino went undercover, and struck up a relationship with him. This drew a good deal of unwanted publicity towards her, and what's more, her feelings towards Neon began to interfere with the case. In the end, Neon and his digimon were exposed, and Yoshino was forced to perform the difficult task of erasing his memory. Time went on, and Yoshino became increasingly doubtful of her performance, especially in comparison to Touma and Masaru, who were quickly advancing in terms of strength. Eventually, Yoshino, Lalamon, and their team-mates were give a mission to go to their universe's Digital World and stop a digimon called Mercurimon, who they mistakenly believed to be eroding the barrier between the two worlds. There, they encountered a young boy named Ikuto Noguchi, who had been stranded there for much of his life and was hostile towards human beings. The group escaped Ikuto, and began traveling towards Mercurimon's location. Along the way, they would stumble into various traps, including one waiting for them in a ravine controlled by a digimon called MetalPhantomon. After MetalPhantomon's servants captured them, the Cyborg Digimon attempted to absorb their hearts and trapped all three humans in their nightmares. Yoshino was forced to relive one of her more traumatizing childhood memories. After the group escaped, Yoshino quickly fell ill, having apparently contracted a virus native to the Digital World. Yoshino would later transfer the virus to Ikuto in a second encounter, which forced Ikuto's partner Falcomon to help Masaru and Touma find the cure for it. After Yoshino recovered, her feelings of doubt had become almost overwhelming. Ikuto and Falcomon attacked them again… but their battle was interrupted by the traitorous Gotsumon, who one of Mercurimon's minions, and his Mammon subordinate. Yoshino, Touma, Lalamon, and Gaomon were separated from Masaru, and Touma became injured. Yoshino's anxieties overwhelmed her, which made her unable to act when Lalamon was forced to defend them Mammon. However, Lalamon used her "Sing a Song" attack, which rekindled Yoshino's memories of their first meeting. Realizing what Lalamon meant to her, Yoshino snapped out it, and upon realizing her inner strength, summoned the next stage of her Digi-Soul. She evolved Lalamon to her Perfect stage, Lilamon, and together, they stopped Mammon. Their mission went on, and eventually, they discovered that Mercurimon was innocent, and that the real villain was a man named Akihiro Kurata. They also gained Ikuto's trust at one point, and after Mercurimon was tragically killed by Kurata's creations, they all became a single team. In their attempts to stop Kurata, they were labeled as traitors by the Japanese government thanks to the man's machinations. They later escaped to the Digital World, where they became the targets of Kurata's minions: Kouki, Ivan, and Nanami. It was in a battle with these three that Yoshino and her comrades first triggered their "Ultimate" Digi-Souls, which allowed their partners to evolve to the Ultimate level for the first time (in Lalamon's case, a digimon called Rosemon). After this, the group became the defenders of their Digital World's "Holy Capital", which rested on the back of a digimon called ElDoradimon. This became the site of a great battle between them and Kurata's forces, and Yoshino personally battled Ivan, who had become enamored with her. Together, Yoshino and Lalamon defeated Ivan's powered up form, BioSpinomon. This was not enough to save ElDoradimon, however, and Kurata used the digimon's life force to awaken a digimon called Belphemon. Belphemon was eventually defeated, though, through the power of Masaru and Agumon's final form, ShineGreymon Burst Mode. This came with a price, though, and ended up creating a huge rift between the Human and Digital Worlds. This earned the human world the malice of the "god" of the Digital World, Yggdrasil, who had come to inhabit the body of Masaru's father, Suguru Daimon. Yggdrasil ordered his servants, the Royal Knights, to destroy the human world, and the DATS team was forced to fend them off. It was through a battle with Duftmon that Yoshino was able to trigger Lalamon's own Burst Mode. Eventually, Yggdrasil was separated from Suguru, and it ultimately met defeat at Masaru's hand. The barrier between worlds was repaired, and DATS made the decision to close off access to the Digital World. Yoshino and Lalamon went their separate ways, as the latter wanted to share everything she had learned alongside humans with the rest of her kind. Ultimately, Masaru went with Lalamon and the other Digimon, as he wanted to continue fighting alongside Agumon. In the months that followed, Yoshino never forgot about her lifelong friend. But someone else began to weigh on her mind… namely, Masaru, whose drive to succeed and overcome the odds had come to inspire her to become stronger. Yoshino began to train herself in using her Digi-Soul much as he had - by channeling it offensively through her fist. Yoshino had come to admire Masaru a great deal, and the more she thought about him… the more those thoughts became something more. Yoshino found herself drawn into another reality's Digital World, this time by a Yggdrasil that was different from the one that DATS had faced in her world. She first arrived in D'Ango Forest, where she was reunited with Megumi Shirokawa, who had also been a member of DATS, and Lalamon. Together, they eventually found themselves in Junk City, where they met up with Miki Kurosaki, and her and Megumi's partners, PawnChessmon Black and White. Yoshino took to exploring the area around the city, and was absent when Shego took Megumi captive. She and Lalamon encountered Simon on their return, and befriended him. Megumi eventually escaped, and rejoined the group, and for a while, the six of them stayed in Junk City with Simon and his partner Lagann. However, Yoshino was able to barter travel for them to Tetha (where they knew other people from their world were staying) with a group of Pteranomon using a Digimental of Darkness that Megumi had found in the Dark Area. On her first night in Tetha, Yoshino was eager to meet up with Masaru again. She showed him just how much she'd advanced since they'd last seen one another… by punching him in the fact with a Digi-Soul empowered fist. Yoshino was almost horrified, but Masaru reacted to it with enthusiasm. Afterwards, Yoshino ended up staying with Masaru and his family at their place with Tetha. Contentment would be short lived, however. After discovering Masaru had made plans to battle Bass, Yoshino became angry towards him. Her fears were justified, as Masaru ended up seriously injured at the hands of Bass's partner, BlackGabumon. Later, the two had another argument… where Yoshino revealed her growing feelings for Masaru. Embarassed and hurt, Yoshino wanted to make up for it. She went with Chika, Lalamon, and Chika's partner, Piyomon, to D'Ango forest to find some Kunemon silk that would help with Masaru's healing. However, the four of them mistakenly stumbled upon a hive of DoKunemon instead, and when they were attacked, Yoshino was stung and poisoned. She was rushed back to Tetha, where she was hospitalized. When Yoshino awoke, however, she found her friends - including Masaru - gathered around her in her hospital room. After everyone else left, she and Masaru talked things out… eventually agreeing that they'd try traveling together when DATS tried to expand itself in the Digital World, and see where that led them.